JERUSALEM - A baby and her pregnant mother were among three Palestinians killed by Israeli strikes in Gaza overnight Wednesday, officials said, as the Jewish state struck a series of targets in response to dozens of rockets fired at its territory. Enas Khammash, 23, and her 18-month daughter, Bayan, were killed in an airstrike in Jafarawi in central Gaza, the health ministry in the Hamas-controlled strip said, while her husband was injured. The ministry said Enas was also pregnant. 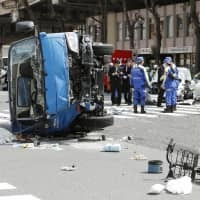 The Israeli army did not immediately comment on the incident, but said it had struck around 100 “military targets” belonging to Hamas in the strip. 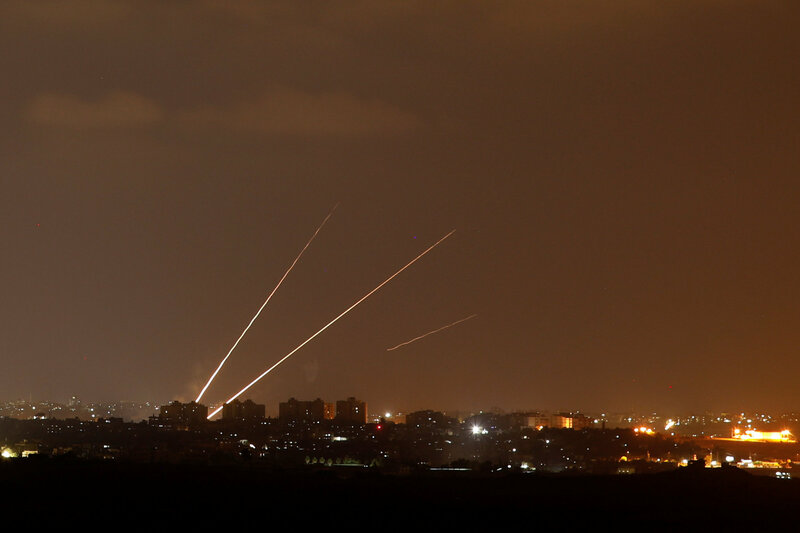 “The Israeli strike was conducted in response to the rockets launched from the Gaza Strip at Israeli territory over the course of the evening and night,” it said in a statement. It said the targets “included manufacturing facilities, training complexes and advanced weapons and capability sites” belonging to Hamas. 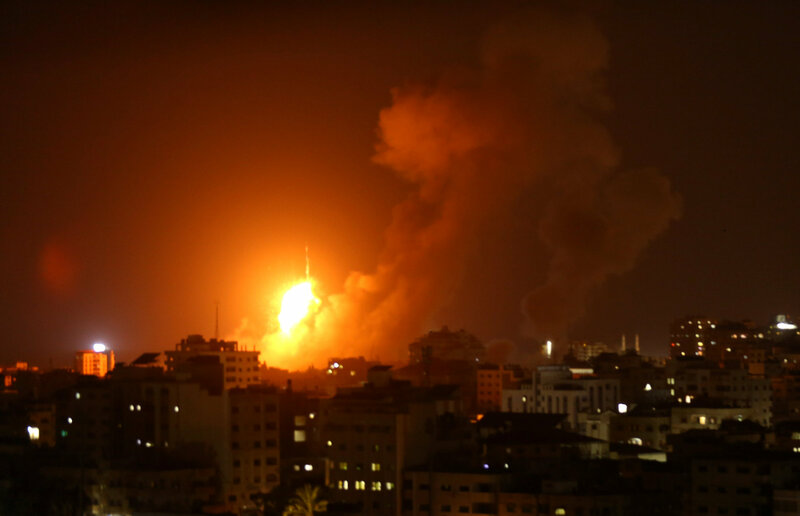 Smoke plumes could be seen rising from Gaza City Wednesday evening. A Hamas militant was killed in one strike, with at least 12 others injured, the health ministry in Gaza said. 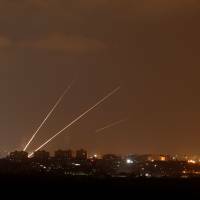 The strikes came after dozens of rockets were launched from the coastal enclave toward Israel late Wednesday. The country’s Iron Dome missile defense system intercepted 11 of the roughly 70 launches, the army said, while most of the others landed in open areas. At least two hit the Israeli town of Sderot, near Gaza’s northern border, police and the army said. A statement from the military wing of Hamas, the Islamist group that runs Gaza, claimed responsibility for the rockets. Sirens were sounded in several Israeli areas close to the border with Gaza, warning residents to seek immediate shelter, the Israeli army said. “As of now, approximately 70 rocket launches were identified from the Gaza Strip at Israeli territory,” the army said in a statement. Israeli television broadcast images of a house and cars reportedly damaged by the rockets in Sderot. The United Nations condemned the Hamas rocket fire. “I am deeply alarmed by the recent escalation of violence between Gaza and Israel, and particularly by today’s multiple rockets fired toward communities in southern Israel,” U.N. envoy Nickolay Mladenov said in a statement. 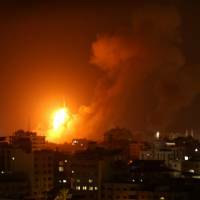 The rocket fire came after two fighters from the military wing of Hamas were killed by Israeli fire on Tuesday. Hamas warned Israel — with which it has fought three wars since 2008 — it would pay for the attack. Clashes along the Gaza border since the end of March have seen at least 165 Palestinians killed by Israeli fire. The majority were killed during violent protests, but others have died in airstrikes or tank fire. The last war in 2014 ended with a tense cease-fire and analysts say another round of conflict remains likely.